Just to the north of Austin in historic Round Rock, Behrens Ranch is the perfect community for those who are seeking the solace and serenity of luxurious hill country living but require all the benefits of being in close proximity to Round Rock and Austin. 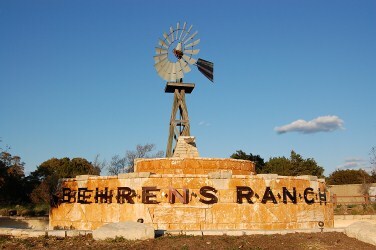 Behrens Ranch consists of app. 500 tree covered acres, as well as a community center and pool. The City of Round Rock is one of the fastest growing small cities in Texas with a population approaching 100,000 people. Residents also have some great shopping nearby at the Round Rock Outlet Malls, 1890 Ranch, IKEA, Wolf Ranch at Georgetown, and the Domain. Commuters can also be in Austin, Cedar Park, Georgetown, Pflugerville, and Leander rather quickly. Major emplyers nearby include DELL Computers, St. David's Round Rock Medical Center, Scott and White Round Rock, the City of Round Rock, and State Farm Insurance. Homes for sale in Behrens Ranch in Round Rock typically run from the low $300’s-$400's. Cactus Ranch elementary, Walsh Ranch middle, and Round Rock high school.